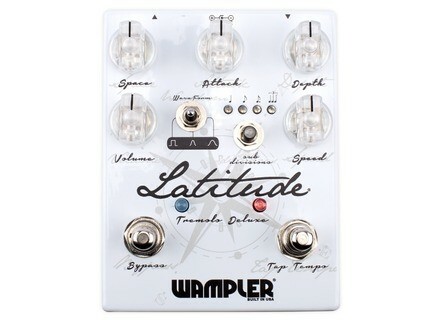 Latitude Deluxe, Tremolo pedal from Wampler Pedals. Baaaz's review (This content has been automatically translated from French)" Transparency!" 3 blow away to drive a tempo, one single blow to resynchronize the oscillation, that's cool! - knob SPEED: for quick adjustment of the effect, attention, touching it, it inevitably breaks the tempo sync that there might have been, fortunately, life is damn good and this knob is the farthest of Switching foot, so little risk of accident. 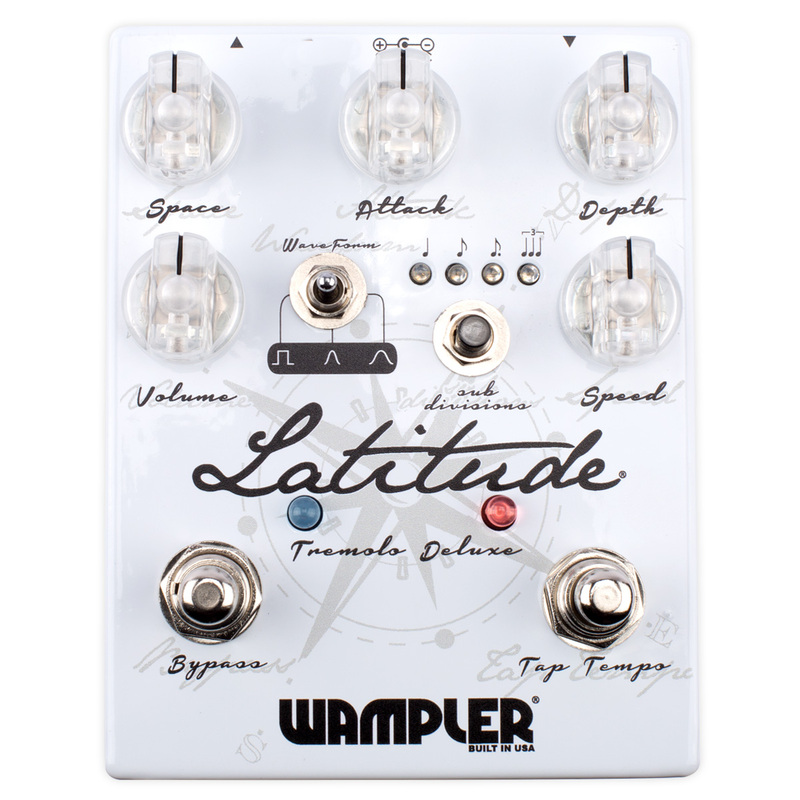 - Waveform selector (manual): square, sine, peak, overall, the last two gives a soft, classic tremolo, the first, without being a real chopper, provides a really choppy, while remaining natural and very warm compared to digital merdouilles usual. - Knob DEPTH: depth of the effect at least: no influence on the sound, max: yaaaah it ripped! - LEVEL knob, tremolo no level is like a cordless guitar is nice but it is pointless. To adjust according to the output level of your guitar for example. The manual is one page both sides, and is more than enough to present the various parameters and provide some typical settings. Thus we learn, for example, set all knob noon produces a fairly standard tremolo and mat, a good base to look for her. Practice. Operation is simple in it even, but sync a tremolo is always a bit delicate. A knock on the tap tempo, used to resynchronize the wave tempo driven. Very practical! Transparency of the tremolo is just amazing. The pedal is only on the volume, and absolutely do not denature the sound color. Thus it is quite possible, playing the pedal assembly and properly adjusting the volume of the craft, juggling freely between the original sound and effect sound, while keeping a real consistency of tone color. Instead you gun down your fingers to do vibratos, why not try to turn the pedal on the damn dotted half that rots you life? I use it for 2 weeks, it does little to notice, but I am completely satisfied. Price, well yeah, must love the tremolo effect anything. I tried the Catalinbread Semaphore, great also, unfortunately longer available new.